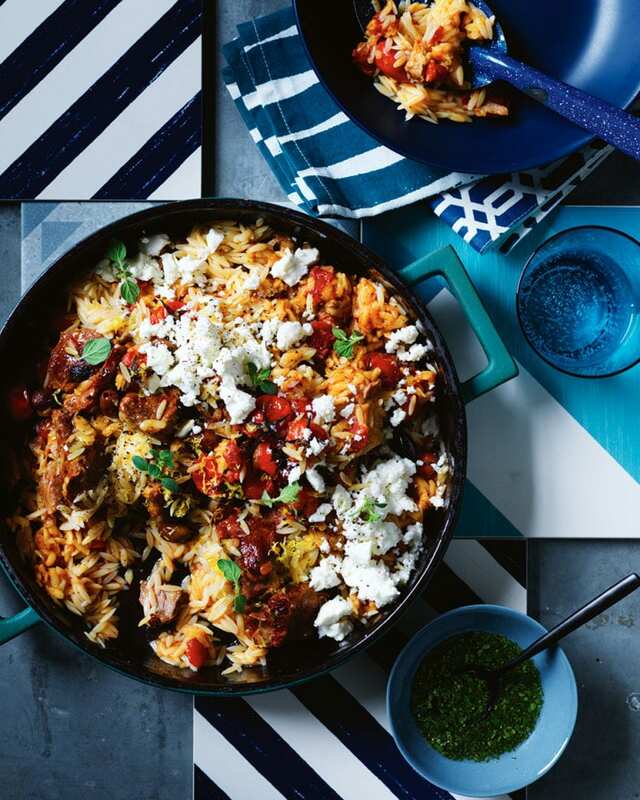 We’ve taken the bold flavours from Greece and created a dig-in and please-all pasta bake recipe made with slow-cooked lamb, orzo, olives and feta. Heat the oven to 180°C/160°C fan/gas 4. Heat the oil in a large flameproof baking dish with a tight-fitting lid on the hob over a high heat. Season the lamb generously with flaky sea salt and freshly ground black pepper, add it to the dish, then fry for 5 minutes until browned on all sides (you may need to do this in 2 batches). Stir in the onion, dried herbs, bay leaves and spices. Add the tinned tomatoes and 150ml of the hot stock, then stir well and bring up to a simmer. Cover with the lid, transfer to the oven and roast for 1½ hours until the lamb is tender. Add the orzo pasta, peppers, olives, tomatoes, remaining hot stock and a generous pinch of flaky sea salt and freshly ground black pepper. Stir well, re-cover with the lid, then return to the oven for a further 30 minutes or until the pasta is just tender. In a small bowl, mix all the mint sauce ingredients with a splash of freshly boiled water from the kettle. Taste and adjust the seasoning. Remove the lamb/pasta from the oven, stir well, then crumble over the feta, scatter with the lemon zest and serve with the mint sauce. We’ve made our own fresh and zingy mint sauce, but you can use good quality store-bought too. Make the lamb sauce to the end of step 2, cool, cover and keep in an airtight container for up to 3 days. Try to find a Greek xinomavro (Waitrose and M&S have one) or pick a youngish red rioja (a crianza would be ideal).